Baptism is a visible sign of God's affirming love, sometimes extended to us before we are even aware of it. We celebrate baptism of children, teenagers and adults, believing that God's promise extends to both the individuals being baptized and their families. Baptisms are performed during the Sunday worship service. Since this is a sacrament of belonging, the presence of the congregation is an important part of the rite. Baptisms are normally done for members, those who regularly attend worship or those who have demonstrated their intention to become part of our church family through participation. Please contact the Church Office or speak to the Senior Minister if you are interested in a baptism at the church. The marriage service is a joyful expression of love and faith. As an Open and Affirming church, we perform services for any marriage that is legal in the state of New York. Please contact the Church Office to learn more about scheduling a wedding and/or reception at The Scarsdale Congregational Church, and click here for our wedding policies. 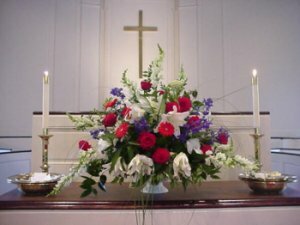 The Scarsdale Congregational Church can provide comfort to the grieving and help in the planning of a funeral or memorial service celebrating the life of a loved one. Please contact the Church Office to learn more about scheduling a funeral or memorial service at the church. Click here for our funeral and memorial service policies, and to learn more about the Philip and Nancy Washburn Memory Garden, click here.